With Christmas right around the corner, there's no time like the present to bake. 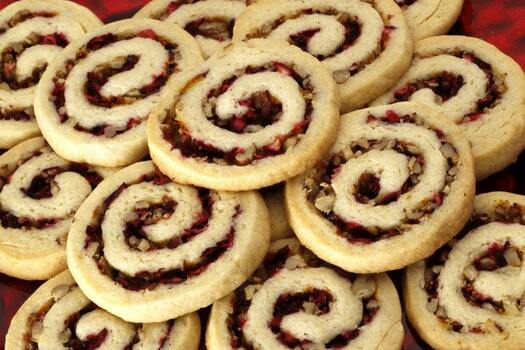 We’ve got you covered, recipe-wise, with the five winners from the 15th-annual Star Tribune Holiday Cookie Contest: Cranberry Cornmeal Shortbread Cookies (pictured, above, in an image by Star Tribune photographer Tom Wallace), German Sour Cream Twists, Limoncello Kisses, Mocha Cappuccino Cookies and Chocolate Toffee Cookies. Why? Because their elegant appearance masks a ridiculously easy-to-prepare formula. Our tip: Splurge and invest in Dufour Pastry Kitchens brand puff pastry, an all-butter product that’s available in the frozen foods section at most Whole Foods Markets and many natural foods coops. It’s roughly three times the cost of shortening-based Pepperidge Farm puff pastry, and the expenditure is worth every penny. Note: This recipe must be prepared in advance. 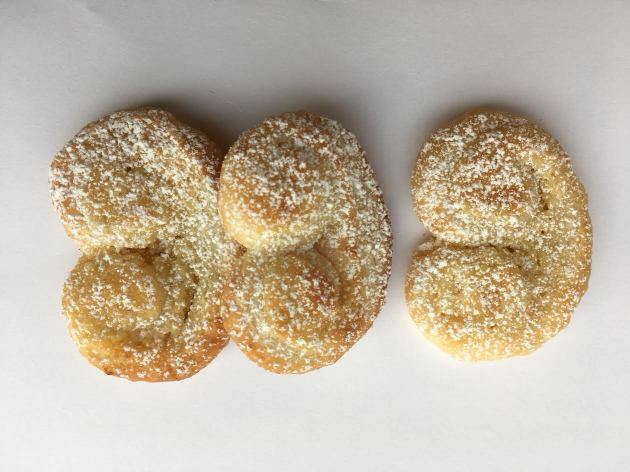 Palmiers (pronounced pahlm-YAYs) go by many other names, including elephant ears, palm leaves and French hearts. This recipe is from 2011 finalist Kay Lieberherr of St. Paul. In a bowl of an electric mixer on medium-high speed, beat butter until creamy, about 1 minute. Add powdered sugar and almond paste. Beat until creamy, about 1 minute. Add egg and almond extract, and beat until thoroughly combined. Sprinkle work surface with 1 tablespoon granulated sugar. Carefully unfold 1 puff pastry sheet over sugar and sprinkle with 1 tablespoon granulated sugar. Using a rolling pin, roll puff pastry sheet into a 12-inch square. 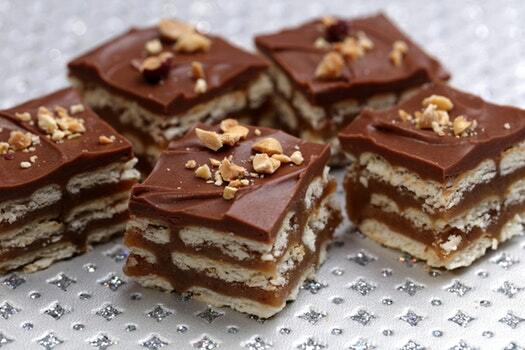 Divide almond paste mixture in half. Carefully spread half of almond paste mixture evenly over top of puff pastry sheet. Starting on both sides, roll opposite sides of puff pastry sheet, from the outer edge to the middle, with rolls meeting in the center. Firmly press together, wrap in plastic wrap and refrigerate at least 2 hours and up to 2 days. Repeat with second puff pastry sheet. When ready to bake, preheat oven to 400 degrees and line baking sheets with parchment paper. Unwrap puff pastry logs and, using a sharp knife, trim off uneven ends. Cut dough into 1/4-inch slices and place (flat side down) 2 inches apart on prepared baking sheets. Bake until golden brown, 12 to 14 minutes. Remove from oven and cool 2 minutes before transferring cookies to a wire rack to cool completely. Dust with powdered sugar, if desired, and serve. Why? Because this festive cookie tastes even better than it looks. Our tip: Use a rolling pin to slightly press the filling into the dough to keep the cranberries and pecans from falling out of the cookie. Before freezing the dough, gently imprint it with exact quarter-inch marks, so cookies will be the same size when sliced. Note: This dough must be prepared in advance. This recipe was from 2012 finalist Annette Poole of Prior Lake. Why? Because kids of all ages will reach for them. Our tip: Place the peppermint candies in a tightly sealed plastic bag before crushing them. Note: This recipe is from 2014 finalist Karen Evans of Minneapolis. To prepare cookies: Preheat oven to 350 degrees and line baking sheets with parchment paper. In a medium bowl, whisk together flour, cocoa, salt, baking powder and baking soda, and reserve. In a bowl of an electric mixer on medium-high speed, beat 1/2 cup butter until creamy, about 1 minute. Add granulated sugar and beat until light and fluffy, about 2 minutes. Add egg and vanilla extract, and beat until thoroughly combined. Reduce speed to low, add flour mixture and mix until just incorporated.Roll dough into 1-inch balls. Place dough 2 inches apart on prepared baking sheets, flattening dough slightly. Bake until cookies are set and dry-looking, about 10 minutes. Remove from oven and cool 2 minutes before transferring cookies to a wire rack to cool completely. To prepare topping: In a bowl of an electric mixer on medium speed, combine 3 tablespoons butter and powdered sugar, and beat until creamy. Add peppermint extract and enough milk (or cream), 1 tablespoon at a time, and mix until smooth. 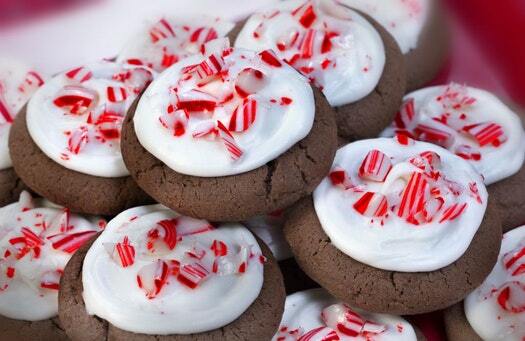 Spread icing across the top of each cookie, then press iced cookies into crushed peppermint candies. Why? Because orange and chocolate are an irresistible combination. Note: This 2007 recipe is from winner Eileen Troxel of St. Paul, who adapted the recipe from Traditional Home magazine. In a bowl of an electric mixer on medium-high speed, beat butter until creamy, about 1 minute. Add sugar and beat until light and fluffy, about 2 minutes, scraping sides of bowl occasionally. Add egg yolk and orange zest, and beat until thoroughly combined. Reduce speed to low, add flour and mix until just incorporated. On a lightly floured work surface, using a lightly floured rolling pin, roll dough to 1/4-inch thickness. Using a 1 1/2 -inch round cookie cutter, cut dough into rounds, and place cookies 1 inch apart on prepared baking sheets. Repeat with remaining dough, gathering up scraps, re-rolling and cutting until all dough is used. 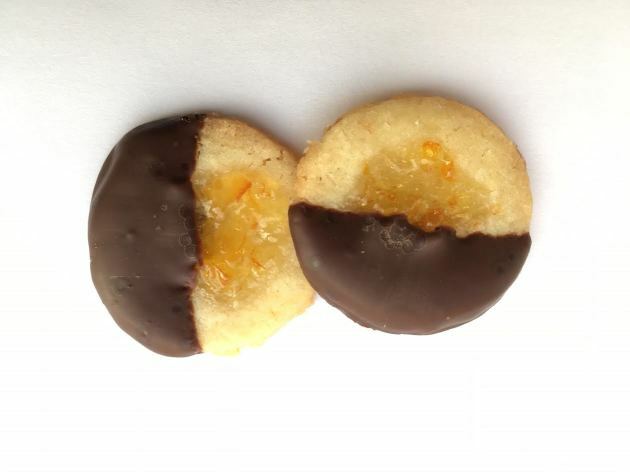 Using your thumb, make a slight indentation in center of cookie and fill with ¼ teaspoon orange marmalade. Bake until edges are lightly browned, about 12 minutes. Remove from oven and cool 2 minutes before transferring cookies to a wire rack to cool completely. In a double boiler over gently simmering water, melt chocolate, whisking in enough butter (1 tablespoon at a time, up to about 4 tablespoons) to make a good dipping consistency. Dip half of each cookie in chocolate and place on wax paper until chocolate sets. Why? 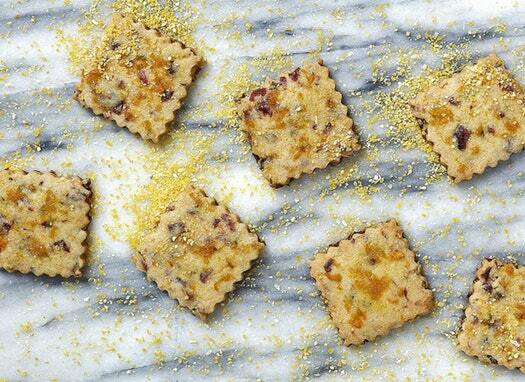 Because they’re delicious, and ridiculously easy to prepare; no baking required. Our tip: Enlist kids to help, they’ll love it. Makes about 3 dozen bar cookies. Note: We decorated with dry-roasted, unsalted peanuts, to alert eaters with food allergies that the bar cookies contained peanuts. Natural peanut butter (no sugar added) really works well for these cookies. This recipe is from 2015 finalist Julie Olson of East Bethel. In a saucepan over medium heat, combine butter, milk, granulated sugar, brown sugar and graham crackers. Bring to a boil and stir continuously for 5 minutes; do not allow mixture to burn. Remove from heat. Layer the bottom of a 9- by 13-inch pan with Club Crackers. Pour half of hot mixture over Club Crackers. Add a second layer of Club Crackers over mixture. Pour remaining half of hot mixture over the second layer of Club Crackers. Add a third layer of Club Crackers. Refrigerate until set. When bars are set, combine chocolate chips, butterscotch chips and peanut butter in a microwave-safe bowl. Cook mixture, stirring occasionally, until fully melted and stir until smooth. Pour melted topping over top layer of Club Crackers and spread evenly across bars.